Occupying a spot of prime real estate opposite Tower Bridge, this brand spanking new London theatre is a 900-seater space that's been dreamt up by Nicholas Hytner and Nick Starr's London Theatre Company. During his long reign over the National Theatre, Hytner found a winning formula of updates on classics and blockbusting new writing, and he's tried to apply the same approach to his new gaff, albeit with less immediate success. 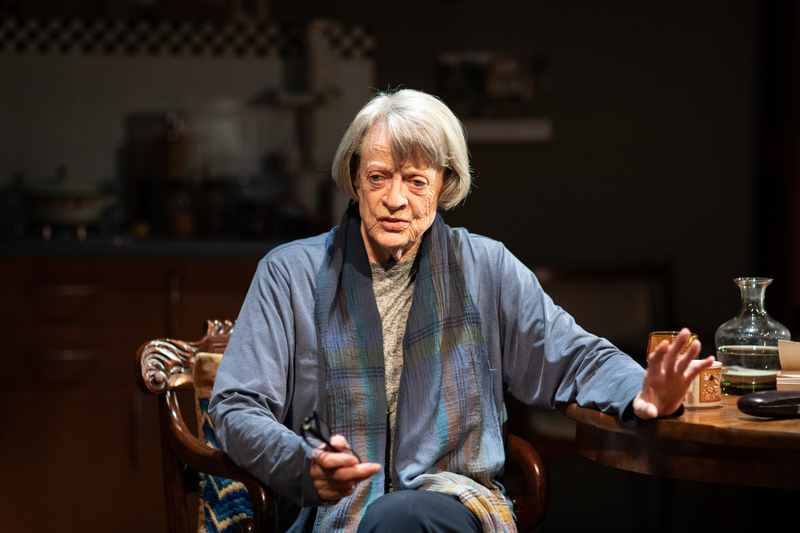 His rabble-rousing interactive take on 'Julius Caesar' wowed critics, but although this new space has attracted a roster of leading playwrights like Barney Norris, Martin McDonagh and Richard Bean, they haven't always done their best work here. 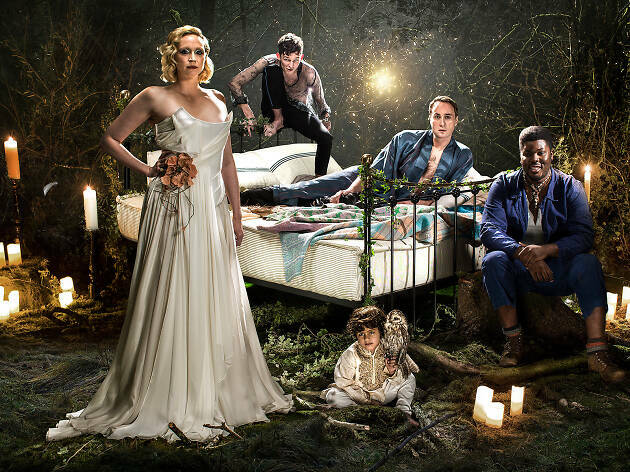 Still, the Bridge Theatre does excel in providing a level of comfort and spaciousness that you won't get at the West End's charming-but-cramped historic playhouses. It has a grassy terrace with views of the Thames, a vast foyer perfect for sipping wine in a leisurely fashion, and a cafe-bar that makes much of its freshly baked madeleines. Oh, and if you've ever spent the whole interval waiting to spend a penny, know that Bridge Theatre has the most commodious toilets in all of theatreland. Its 900-seater auditorium is fully flexible, meaning it can swap from a trad proscenium arch set-up to a promenade arrangement that lets audiences members move around. 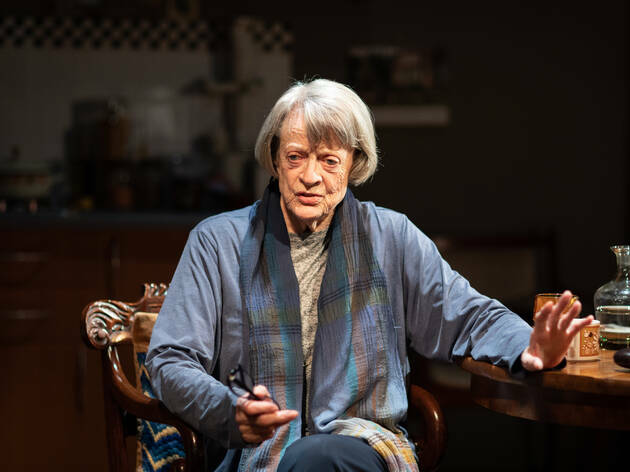 With some of the UK's most exciting writers under commission, there's still room for Bridget Theatre to brew a hit to rival Hytner's old stamping ground the National Theatre, just a few miles upstream. Brilliantly located with stunning views of Tower Bridge and all the eateries around. It's a small theatre but plenty of seating in the waiting hall before a play begins, to grab a drink and to have some food from St. John's. When the madeleines are baking, the entire waiting area is filled with a buttery scent, which is so lovely to walk out to! A relatively new and modern theatre in the shadow of Tower Bridge, this 900 seater venue is what modern theatres should be. Ample leg room, comfy leather seats and plenty of toilets and a large bar mean this really is a great place to come and see a play when compared to some of the older venues in the West End where toilet queues are massive and you get lost in the old winding corridors and staircases. I'd definitely come and see theatre at this venue again. Their cheese straws and ice cream along with a tasty IPA go down a treat too. What an amazing theatre!!! The seats are amazing, the toilets are huge (it's a big thing when you're a girl/woman) and the stage is absolutely massive and fantastic. The best of all is obviously the view as you walk out the theatre. I would definitely recommend watching a show there, the only downside would be the prices of drinks and nibbles. Brilliant theatre in a brilliant location. The location is obviously unrivalled with unobstructed views of the Tower Bridge. I know one doesn't go to theatre to look outside, however while you wait for the play to start with a glass of wine, the view suddenly becomes important. The theatre offers great food and beverage options and is beautifully designed. The circular shape of the theatre is reminiscent of the infamous Globe Theatre, injected with a twist of modern. A fantastic location - looking out onto the Thames and Tower Bridge and such a change from the usual ornate Victorian theatres of the West End. The foyer is a wonderful, light, open space and the loos are plentiful, clean, and spacious. The ticket desk, is on the right as you walk through the entrance, further along the bar, selling a limited amount of beers and further along still, an area which sells trendy snacks and small meals. The seating in the foyer area, in which customers are meant to consume food and drink. doesn't make the best use of space and looks uncomfortable and uninviting. The auditorium itself takes your breath away when you first enter - magnificent. Comfortable seats, good raking, good leg room. Unfortunately, the production I saw had actors who either couldn't project their voices, or the acoustics were poor - I'm not sure which - but it is a complaint I overheard many times during the interval. It has some magnificent productions coming up - and I have already booked two of them - both with main characters performed by seasoned actors. It will be interesting to hear how well the voices project compared to the current production. This theatre will be embraced by Londoners, I have no doubt. Every venture has teething problems. I wish it every success. 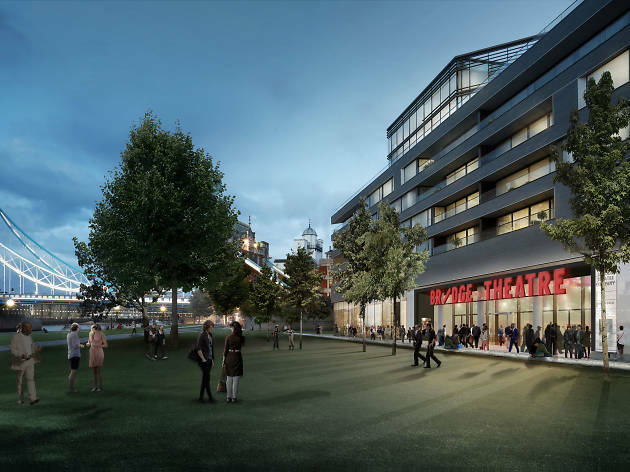 Bridge theatre is a beautiful, new modern theatre on the South Bank, next to Tower Bridge. It has a huge open stage that can cope with innovative set design. Although it is big, it must hold close to 1000 people, the auditorium is such that every seat has an excellent view. A nice addition to London's theatre scene. Stunning modern theatre! Beautifully designed, and perfect location. The bar / cafe area is tasteful with lots of seating - though get there early before a performance to get a good seat if plan to get something to eat. The food wasn't the cheapest, but after all you are in a theatre and it is very tasty. The show hall itself was really interesting. 360 seating in an auditorium style, which means you are never too far from the action. Though the seats at the top did look rather high, so maybe avoid those if afraid of heights. As people have mentioned, the toilets are very glamorous. Looking forward to returning next week for the new production. What a theatre! Really modern design with tons of character, reminiscent of the nearby Globe. The round auditorium is amazing. And ladies - just wait till you see the loos! There are no long queues here, just lots of cubicles, 'Hollywood style' mirrors and tons of space. The bar is good too - tasty food, friendly service and great drinks selection. But more than anything, the location is STUNNING. You walk out after an amazing show, take in the view and realise that you really are in the most amazing and beautiful city. I love this theatre! Beautiful views! Beautiful theatre! New and modern! Every seat looks to be great! Excellent coffee, food and loads of space to sit and enjoy it. i really like this theatre ... Its spacious they serve food and wonderful wine here all at very reasonable prices! A glass of champagne starts at £7.50 .. The food is mostly sandwiches and cakes but they sounded and looked yummy!! The stage is rather large and I'd say its perfect for a concert or music performance.. Looking forward to seeing what other shows they'll have here. This theatre looks good and the stage area was impressive but seating wise it was a little awkward. I know many theatres provide very little leg room but our particular seats were very ‘compact’ and because you had to pass by others to get to your seats it became quite a feat to achieve. You can forgive older London theatres for no leg room but this theatre is brand new so they have no excuse other than wanting to make more money from more bums on seats I assume. The main bar and food area was pleasant with lovely lighting decor but as with much of London it was fairly pricey for anything. To sum up...good stage, nice looking space, bad seating. 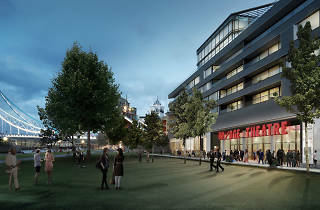 The new venture from Nicholas Hytner, formerly of the NT, the Bridge theatre is a really, really well-thought out venue. There's a good amount of leg-room for the seats; there are enough women's bathrooms to negate huge queues; the side seats are set at an angle to the stage - essentially, it fixes all of the small annoyancies that haunt pretty much every older theatre in London (Old Vic and your 'restricted view' seats, I'm looking at you). If you get the chance to check out a show at the Bridge, you really should. It's a great theatre... and very Insta-worthy. Brand new theatre in London Bridge, a stones throw away from Tower Bridge. The outside is iconic and the name is lights, you can spot from across the river. As you go inside, the lighting in the foyer is so pretty, the bar is nice but pricey as is the food. This place only opened last week and there's lots of staff on hand. The toilets are not phenomenal, best theatre loos I have ever been to.